"Spirit Traveler: Unlocking Ancient Mysteries and Secrets of Eight of the World’s Great Historic Sites" takes a unique approach to analyzing why famous historic sites, including the Great Pyramids, Stonehenge, and Tiwanaku, were constructed. Scientists and archaeologists have written thousands of books about these sites. While this information is crucial to our knowledge today, much of the mystery about these places remains unsolved and questions surrounding their purpose have lingered throughout the centuries. "Spirit Traveler", the companion book to the documentary film with the same title, offers a completely different perspective on why these sites were erected and what purpose they served. Only Sonja Grace, the internationally known mystic healer, is able to reveal the secrets of these ancient buildings in this new and fascinating way. Sonja is a Spirit Traveler deeply devoted to the protection of our beautiful Earth. She has spent a lifetime working in the ethers with angels and guides. She sheds light on what the people and cultures of the past were doing at these sites and why, offering a brand new understanding of the events that took place there centuries ago. Sonja Grace brings her unique understanding of the truth to history. In Spirit Traveler, Sonja travels back through the realms to reveal history as it happened. She answers the questions that have puzzled historians and archaeologists for hundreds of years: What was the purpose of Stonehenge? How were the Great Pyramids built, and why is their particular geometry so significant? Why was Skellig Rock so important to the monks? Have our beliefs about these great sites been wrong all along? Is their importance something other than what we have always thought? Sonja Grace’s discoveries shine a whole new light on our historical understanding of these places and on their relationships to the Earth. Sonja Grace aims to bring a new spiritual truth to these questions and fulfill her purpose in the awakening of humanity. Spirit Traveler is a purposefully structured book. Sonja discusses eight specific historical sites: Skellig Michael (Ireland) Tiwanaku - The Gate of the Sun (Bolivia) Stonehenge (England) Hagar Qim (Malta) St. Winifride’s Well (Wales) Chichen ltza and Temple of Kukulcan (Mexico) The Great Khafre Pyramids (Egypt) the Rock of Cashel (Ireland). Each chapter tackles the scientific and historical information available about each site up to this point in time. Sonja addresses the questions that continue to puzzle archaeologists and historians. The second half of each chapter is devoted to Sonja’s Spirit Traveler’ experience, what she learned, and the answers to some of those longstanding questions. Few people possess the gifts of Sonja Grace. Her heritage (part Native American, part Norwegian) provides her with the extraordinary ability to transport anywhere. She sees, hears, smells and feels the places she visits. In Spirit Traveler, Sonja shares every single detail of her riveting travels through space and time. Her work is marked by her distinct understanding of the dimensions and realms along with the convergence of Divine and Earth energies, which allows her to travel through the ethers and gather historic information. Kieran O’Mahony grew up in Ireland where he studied geography and science. He graduated from the National University of Ireland with a masters in education and went on to complete his PhD in cognitive Neuroscience at the University of Washington, Seattle. O’Mahony is a Fellow of the Royal Geographic Society of London and is an avid geomorphologist specializing in European post glacial features and processes. Kieran has three sons and a daughter and currency lives in Seattle. "This densely-rendered portrait of ancient sacred sites is painted with a combination of science, history, and metaphysical research. From psychically experiencing the raw energy of Stonehenge to watching a high priestess call forth the goddess from the waters of Saint Winefrede’s Well, Grace recounts this adventure tale of the soul with tremendous insight and a sense of wonder." "The legends of earth temples and tombs whisper a different story of humanity. One we must listen to NOW. 'Spirit Traveller' opens our hearts to new perspectives on time, reality and who we are. Theses incredible power-sites hold encrypted wisdom to show us the way to ONE. This story will inspire you to travel and know self." "History comes alive in an eye-opening way when Sonja Grace lifts the veil of secrecy about each ancient site. What she has revealed is a gift to humanity that can raise us another degree in our collective consciousness." "Traveling non-physically to eight of the worlds most famous ancient sacred sites, Sonja Grace offers us information that scientists and historians are unable to provide. She believes that the small group of humans who created these sacred sites had gifts of sensory perception that the current human race is only now beginning to recognize. She describes it as people being aided by star beings. Readers may prefer to think of it as access to intuitive, universal wisdom from what Jung called the collective unconscious. However it is defined, the insight she provides is fascinating Grace begins each section by separating physical fact from fiction, recounting the legends, analyzing their sources and motivations, and then providing the facts that can be verified to date. Next she recounts her personal experience in meditation. Transported back through time by spirit guides, she experiences standing on the site of Stonehenge, feeling the raw energy of the place before the stones were moved there. She is given insight into the shifting of continents and subsequent destruction of civilizations and into the influx of cosmic rays (something many of us are being told about currently). She watches as a high priestess calls forth the goddess from the waters of Saint Winefride’s Well, meets with the King of Unster at Cashel Rock, and is introduced to a jaguar totem animal at Chichen Itza. Whether readers believe in out-of-body travel or not, this is a densely rendered portrait of ancient sacred sites, painted with a combination of science, history, and metaphysical research." 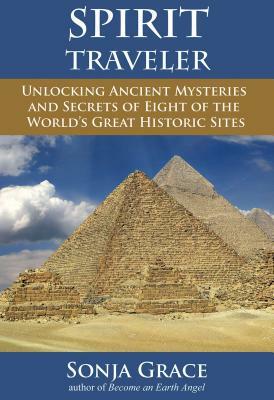 "An inherently fascinating, informative, and occasionally iconoclastic but always consistently compelling study, Spirit Traveler: Unlocking Ancient Mysteries and Secrets of Eight of the World's Great Historic Sites is a unique and critically important addition to personal, community, and academic library Metaphysical Studies collections." "Of Native American and Norwegian descent, mystic healer Sonja Grace has spent a lifetime traveling in the angelic realms, communicating with the archangels and sharing their wisdom. In Spirit Traveler: Unlocking Ancient Mysteries and Secrets of the World's Great Historic Sites she takes a unique approach to analyzing why famous historic sites, including the Great Pyramids, Stonehenge, Tiwanaku (Bolivia), Hagar Qim (Malta), St. Winifride's Well (Wales), Chichen Itza (Mexico), Skellig Michael (Ireland), The Roci of Cashel (Ireland), were constructed. "Spirit Traveler" offers a completely different and metaphysical perspective on the purpose of these sites and the reasons for their construction and is the companion book to the documentary film 'Spirit Traveler' which will be released around the same time as this volume. Inherently fascinating, exceptionally well written, organized and presented, Spirit Traveler is an especially recommended read for both academia and non-specialist general readers." "This newest work by mystic healer Sonja Grace gives the reader true insight into eight ancient sites. These sites remain shrouded in mystery despite an abundance of research. The religious and cultural biases of historians have influenced modern views about these places of power. First, we are informed about what science has uncovered about each of the places. Then, as a spirit traveler, Sonja Grace goes back in time to witness the creation of these places. Her conversations with star beings, demigods, and human ghosts enlighten us. These entities inform her of the reasons behind the rise and fall of these sacred spaces. Her observations from these travels are very informative. This is a great gift for anyone looking for more information about some of the world’s great historic places."